Frozen yogurt, and bring it right here! 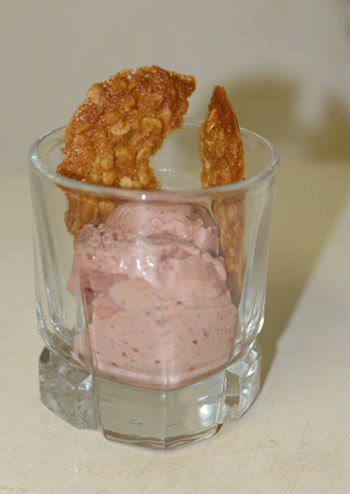 Maybe that song is a little out of season, but fresh fig frozen yogurt is right on the mark. I know fresh figs have an on-and-off season through the summer, but I’ve never seen them for sale in Salem before. 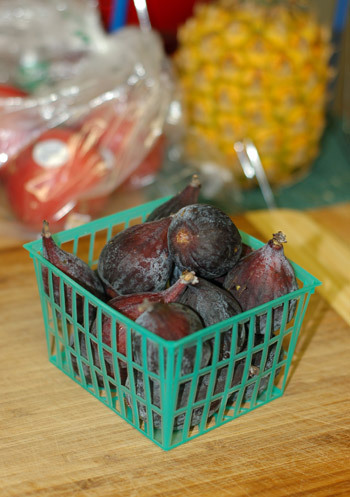 So imagine my surprise when I walked in to LifeSource looking for Napa cabbage and maybe some cherries, and found a few precious baskets of fresh Black Mission figs. A pint jumped in my basket almost before I had time to think. Later in the evening, as I was pondering what to make with my figgy treasure, Jeremy reminded me of the fig ice cream recipe in The Perfect Scoop , accompanied by a impossibly beautiful, shockingly violet photo of the stuff. I hadn’t purchased enough figs for the full recipe, but I decided to go for it anyway, with a few modifications. I pulled in the flavors of honey and Greek yogurt, which are both classic pairings with figs, and at the same time they helped bulk up the yield. I should note at this point that, having never found them at the market, I’ve never eaten a fresh fig before, and the small amount I had to go in the ice cream meant that I only sampled a small bite. I have to admit, although I like the taste of dried figs pureed into baked goods, I was a little put off by the fresh ones, which were simultaneously squishy and full of crunchy little seeds. If I see them again, I’ll try broiling them or something, but I wasn’t really that thrilled. It’s also entirely possible that they weren’t as ripe as they should have been. The fig frozen yogurt, that I made was a different story, however. It was silky smooth thanks to the honey, and very creamy despite the seeds. The fig flavor was very subtle and almost floral, and the honey taste came through beautifully, almost more than I intended. Honey frozen yogurt, all on its own, would be sublime, by the way, and I will definitely remember that for future batches. The only thing I found vaguely disappointing about this experiment was the color, which was a paler, mauvey pink than David’s glorious violet. But with half the figs and more white dairy products, it was to be expected. Ah well. Place the cut-up figs in a medium saucepan with the water and lemon zest, and bring to a steady simmer over medium heat. 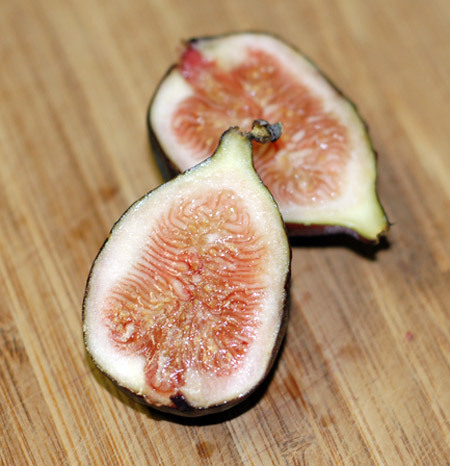 Cover and allow to cook for 8-10 minutes or until figs are tender, stirring occasionally. Remove heat, add sugar and honey, and continue cooking until figs have reached a jam-like consistency, stirring frequently. Remove from heat and allow to cool to room temperature. 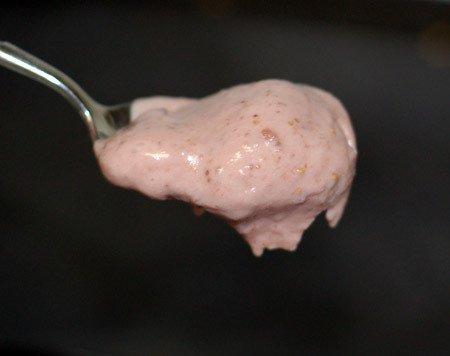 Place fig mixture in a food processor or blender and add the cream and yogurt, and a splash of lemon juice. Process until thoroughly pureed, or to desired consistency. Taste and add more lemon juice if desired. Chill thoroughly in the refrigerator before churning in the ice cream machine. Source: Adapted from The Perfect Scoop , by David Lebovitz. Jeremy suggested that this frozen yogurt would be ideally paired with something like an oatmeal crumble, and I agreed that would be lovely. I ended up finding a Maida Heatter recipe for crispy Oatmeal Wafers, which she claims were a favorite of Norman Rockwell’s. That was all I needed to hear. The recipe has very little flour, which makes a delicate cookie that must be cooked for an exact amount of time so that it neither burns nor clings desperately to the foil-lined baking sheet. With my oven’s track record, this was a tricky proposition, but I told myself that since they were really just for ice cream topping, sheetfuls of demolished cookies would really not be a disaster so long as they taste good. Actually, they came out just fine, releasing from the foil with just a bit of reluctance and a few breaks. 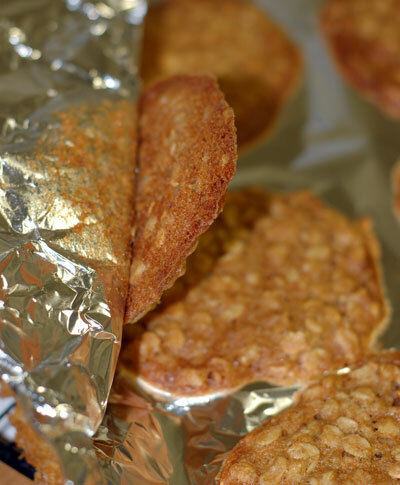 They tasted great too, buttery and carmelized, with a good chew from the old fashioned oats and walnuts. They didn’t stay crisp for long, but that’s what I get for baking this sort of recipe in the summer. No matter—the important thing is that they tasted fantastic with the fig ice cream. These cookies were Norman Rockwell’s favorite, according to Maida Heatter. I’ve never made one of her recipes before, but I will certainly do so again. They were very easy to make, and came out looking and tasting just as I had hoped. Preheat oven to 350F. Cut aluminum foil to fit cookie sheets. Sift together the flour, salt, and baking soda, and then set aside. In a small bowl cream butter with electric mixer. Gradually add both sugars and beat for 2 to 3 minutes. Add the vanilla, water, and egg and beat well. On low speed gradually add the sifted dry ingredients, scraping the bowl with a rubber spatula and beating only until smooth. Stir in the oatmeal and nuts. Use a rounded tablespoon of dough for each cookie, and place them 3 to 4 inches apart on the foil. With the back of a wet spoon, flatten each cookie to 1/4 to 1/3 inch thick. Bake for 13 minutes or until evenly browned. 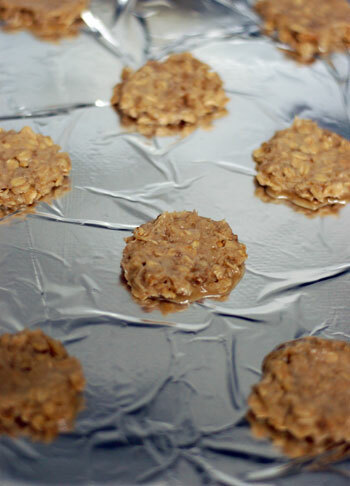 These must be timed carefully; if underbaked, the bottoms will be wet and sticky and difficult to remove from the foil; if overbaked, they will taste burnt and bitter. Slide foil with cookies off baking sheet and let cool. Then carefully and gently peel the foil away from the cookies. The cookie bottoms will look glassy and smooth. Turn them upside down on a cookie rack to cool 5 to 10 minutes and then store airtight. Humidity will take away the delicate crispness of these cookies. Perfect combination! Both the frozen yogurt and the cookies look incredibly good!